Mobile technology is being exploited to the fullest in a new generation of spectrophotometers. Here's a second data point in this developing space. Blaine Bateman gives us a comprehensive introduction today to an inexpensive but functional portable spectrophotometer, the MK350 from UPRtek. And late Wednesday at Lightfair, I found the tiny booth of GL Optic (a brand of Just Normlicht, a company headquartered outside Philadelphia), which has just introduced a similar product, with more functionality and refinement, at a higher price point. The bulk of Lightfair exhibitors occupied the contiguous space of Halls A-E on the second floor of the Pennsylvania Convention Center, covering nearly half a million square feet and spanning several city blocks. Hall F -- down on the ground floor and across a busy street from the main exhibits -- was the budget space where the little guys set up. Lightfair did the best job it could to get people to make the trek down to Hall F. One of the keynotes took place there. There was sometimes free food and drink. There were daily giveaways. There were drawings that you entered by getting your badge stamped at a number of the booths there. And at industry exhibitions, the equivalent of Hall F is often where you can get a first look at something that's going to be big in coming years -- the jewel in the lotus, as it were. At the tail end of my exhausting second day at Lightfair, I finally made the trek down to Hall F, and there I found GL Optic. GL Optic is based in Germany and has an R&D lab in Poland. 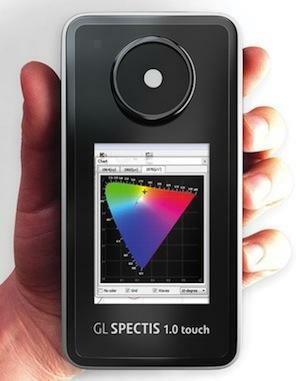 Its small spectrophotometer goes by the large name GL SPECTIS 1.0 touch. I'll refer to it as the Touch for brevity. It's a little thicker than a large smartphone. It has a 3.5-inch color touchscreen and is powered by the Android platform. The spectrophotometer app is basically an Android app running on specialized hardware. Unlike the MK350 that Blaine profiled, the Touch ships with a companion Windows application. I saw it running on a MacBook Pro booted to Windows 7 under Apple's Bootcamp. GL Optic's Eric Dalton, who demoed the product for me, said it also works fine on a tablet running Windows 8. Linux users could use Virtual Box to get a Windows environment there. The Touch communicates externally via an SD card, a USB cable, and (coming soon) Bluetooth and WiFi. Dalton said that the wireless functionality is all working, but his company is awaiting FCC approval before it affixes an official sticker to the back of each device and turns on the radios. The Windows app looks a bit like a spreadsheet. It lets you explore, manipulate, and generate reports on the measurements collected by the device and store measurement data in a sensibly named file hierarchy. Dalton said GL Optic is working on GPS functionality for the Touch. This would simplify the job of taking a measurement every 50 feet in a warehouse, for example. The data would be stored in files whose names incorporate the GPS coordinates. Dalton said the Touch will sell for $5,500, more than twice the UPRtek MK350 price. That's still a discount from devices from firms such as Konica, which cost roughly $6,000 and are based on older technology (black and white nontouch screens, RS-232 interfaces, and so on).